On a recent weeknight at Bud & Marilyn’s, most patrons were enjoying happy hour through frosé-colored glasses, seeking refuge from the hot summer air and an ever-darkening news cycle in a sea of pink slush. 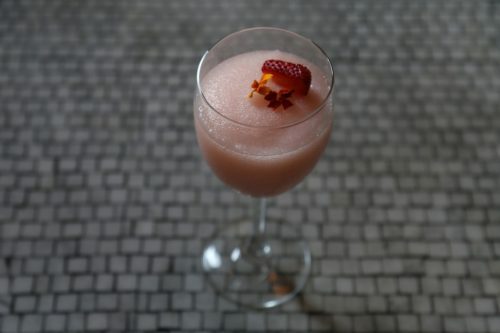 Frozen rosé wine, sweetened with strawberries and blended with vodka and ice, has been a big seller since the Locust Street restaurant added it to the menu this summer. During happy hour, it goes for $6. “They are selling hundreds per week, sometimes even more,” said Marie DiFeliciantonio, a representative for the restaurant. The frosé boom can be traced to Bar Primi, an Italian restaurant on the edge of New York City’s East Village, where general manager Justin Sievers poured a few bottles of wine into the restaurant’s slushie machine to see what would happen. Frosé exploded, with restaurants throughout New York and other cities rolling out their own versions. In Philadelphia bars, 2017 became the summer of frosé. It can be found throughout the city at places like Assembly, which serves it with Petal and Thorn vermouth; Bar Amis in the Navy Yard, where it includes a dash of rum; and even Parc, which added it to the permanent cocktail menu last month due to overwhelming demand. Frosé available at Parc on Rittenhouse Square. But some mixologists and restaurateurs have taken the trend in different directions, riding the frosé wave to other icy treats, such as wine ice pops and sorbet cocktails. Moshulu, the restaurant in a ship anchored just off Columbus Boulevard on the Delaware River, created two fruit-puree ice pops to serve with wine on the deck this summer. The Scarlet is a pineapple and passion fruit Popsicle that comes in sparkling rosé with St. Germaine liqueur; the Giselle is a mango-and-raspberry ice pop served in sparkling white wine with Cointreau. 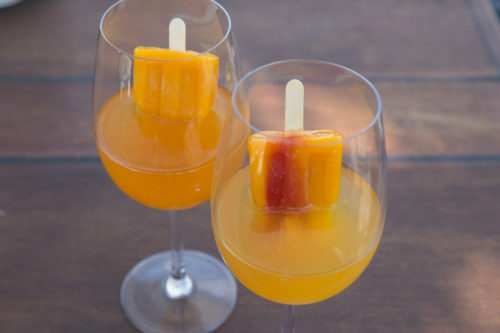 As the pops melt, they mix with the wine and turn into tropical-tinged mimosas. Since rolling them out in May, Moshulu has sold about 1,600 at $12 apiece. Wine ice pops at Moshulu restaurant are the Scarlett (left), a pineapple-passion-fruit Popsicle in St. Germaine liqueurand sparkling rosé, and the Giselle, a mango-and-raspberry-swirl ice pop in sparkling white wine. 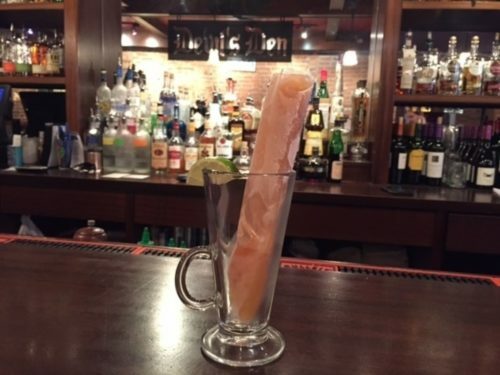 Erin Wallace, owner of Devil’s Den in South Philly, makes boozy ice pops. She changes them every few weeks, usually offering a fruit-based variety and a cocktail flavor, like gin and tonic or mint julep. This week, the pops are made from rum-based dark and stormy cocktails. The restaurant doesn’t have a deep freezer with enough room for Popsicle molds, so early on, Wallace decided the only way to make them was to use plastic, heat-sealed bags that could lie flat. They can be eaten like freeze-pops and, as they melt, squeezed into a glass to drink or to eat with a spoon. Wallace said the trick was determining the ratio between alcohol and the mixer — in the case of the dark-and-stormies, rum and ginger beer — to get the slushy consistency just right. A dark and stormy boozy ice pop at Devil’s Den. The Prohibition Taproom in Callowhill this week started serving three cocktails made with ice cream and sorbet, all of them riffs on classic drinks. The New Daiquiri is made with rum, lime juice, grapefruit, and liqueur made from cherry pits, plus watermelon sorbet. 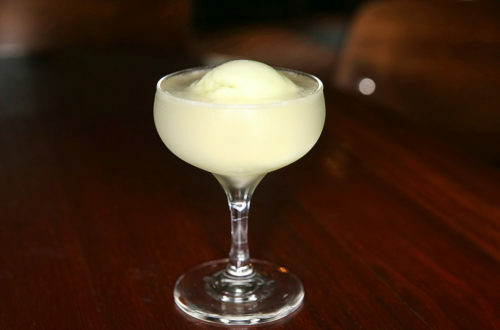 The gin-based Corpse Reviver #2, made with lemon juice and Cointreau, is served with a scoop of green honeydew-lime sorbet floating in the middle. Corpse Reviver #2 at Prohibition Taproom in Callowhill. 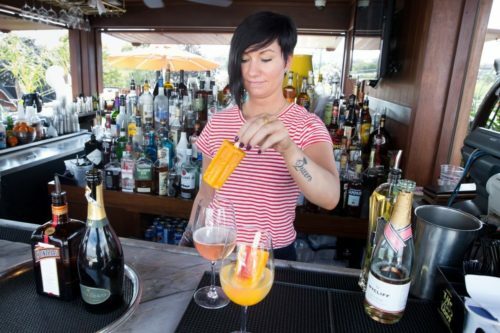 General manager Amy Hartranft, who created the $10-$12 cocktails, said the drinks were born from a desire to experiment with the fresh-fruit flavors found in homemade sorbet.